Coldplay has released a new video, this time for the single Strawberry Swing. In what the band claims to be a “ground breaking” video we see Chris Martin donning a superhero costume and try to save a distressed damsel held hostage by a squirrel. Probably continuing with the spirit of puppet show thing they are doing for their current tour, the video is shot in a unique animation technique using moving backgrounds and other contraptions.The entire set is drawn in chalk. The creative force behind this video is a group of visual artists from London who call themselves Shinola. Previously Shinola had worked with Radiohead and Blur. The video had a world premiere on Babelgum.com on July 20 and it will be shown at at Odeon cinemas before Sacha Baron Cohen’s Bruno and Sandra Bullock’s The Proposal. Check this amazing work of art here . 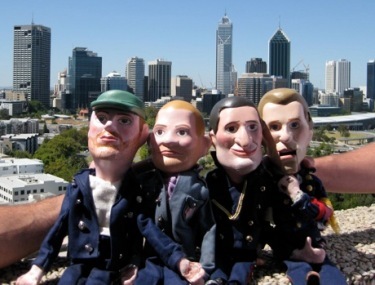 The Coldplay puppets who featured in the Life in Technicolor ii video.